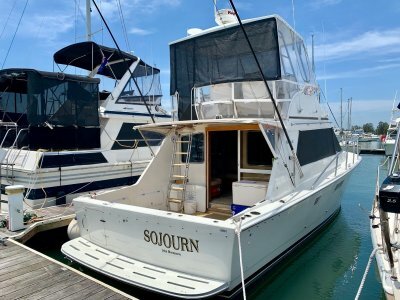 This unique Spacecraft 36 flybridge cruiser is an unbelievable vessel, built for the owner of a Spacecraft factory by request of the boss as his private vessel. Needless to say, the tradesmen have gone out of their way to impress, and have created something that is both unique, and a tribute to the best of marine architecture. Its aluminium construction gives it strength, durability, and a great weight advantage. She is fitted with two brand new engines with less than 10 hours on the clock! The fitout is just superb, all the trimming and doors are made from 'Babinga' South African hardwood. The bright and airy V berth double will impress anyone. The black-leather lounges in the saloon fold out to form another double and single. The bathroom is large with modern fittings and separate shower. The galley is very spacious for a boat this size, with- again, a very modern fitout. The stainless steel fridge is something you would find in a commercial kitchen. She is Air-conditioned with the hull fully insulated by cell-foam which reduces noise through the hull and is impervious to moisture. 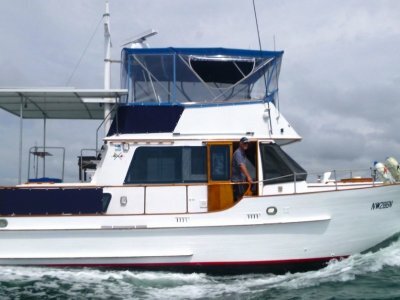 The cockpit has teak decks with heaps of room, a live see-through fish tank, and much more. The flybridge has all the instrumentation you will ever need with great all round visibility, and a very comfortable area for all your friends. 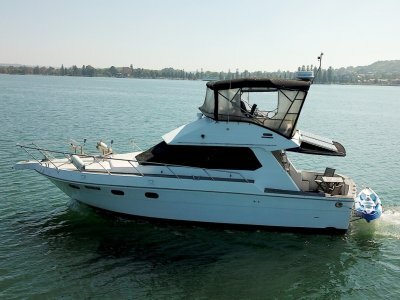 Don't buy any other flybridge, till you consider spoiling yourself with this great vessel. 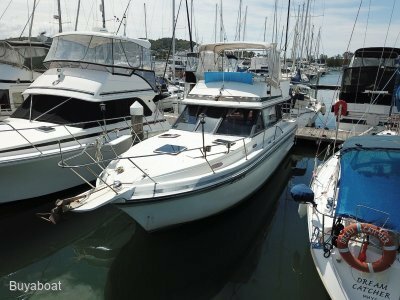 It built as good as if not better than any Riviera, Mariner, Steber Craft, Regal or Maritimo. As New twin Yanmar 315hp, fresh water cooled. Solid 4 blade twin props, with 50mm shafts by Rogers and Luft. V berth Double with lots of cupboard and storage space. Saloon black leather lounges fold out to a single and double beds. 2, separate modern shower connected to head. Other on transom, both with hot and cold water. Electric macerator, with modern hand basin, cupboard storage and holding tank. 2 burner electric hot plates, Panasonic microwave. Stainless steel sink with flip taps, hot and cold water. Utec upright 300L stainless steel fridge. 150 L top load Utec with Mitsubishi stone bench top. Muir anchor winch with 10m of chain and 150 m of rope. 10 life jackets, EPIRB, V sheet, life ring, 2 fire extinguishers, 1st aid kit, flares. Halogen 12 v lighting, 2 x start batteries, 2 x house batteries, shore power, battery charger. Morse electronic engine controls. Furuno Auto pilot, chart plotter and sounder. VHF and 27 mhz radios. Boat ladder, rocket launchers for fishing, live bait fish tank with glass window. Blue underwater lights, windows 6mm tough tinted safety glass. The vessels warped bottom hull, design by 'Bill Bollard' is deep in the bow then flattens at the stern which gives it an amazing ability to ride the flattened wave it creates. 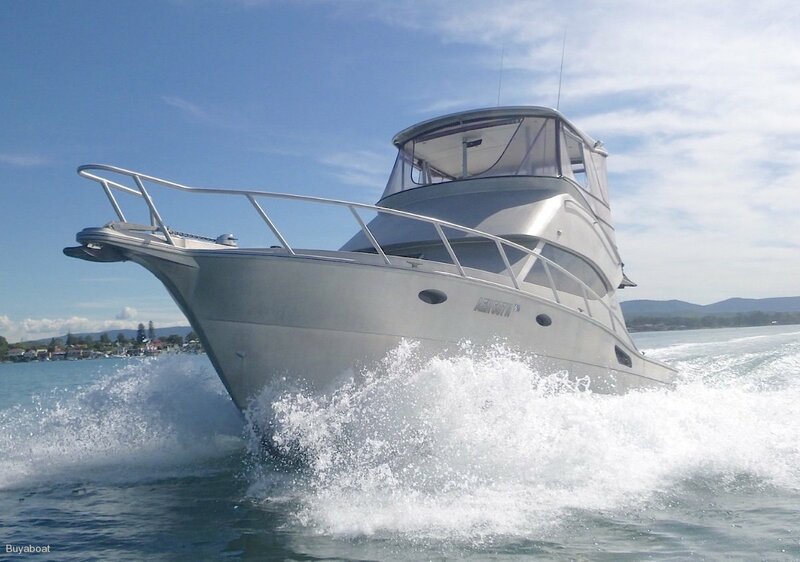 A great boat that will impress the fisherman or the family.